Frank Guidry, a loyal street lieutenant to New Orleans’ mob boss Carlos Marcello, Guidry has learned that everybody is expendable. But now it’s his turn—he knows too much about the crime of the century: the assassination of President John F. Kennedy. Within hours of JFK’s murder, everyone with ties to Marcello is turning up dead, and Guidry suspects he’s next: he was in Dallas on an errand for the boss less than two weeks before the president was shot. With few good options, Guidry hits the road to Las Vegas, to see an old associate—a dangerous man who hates Marcello enough to help Guidry vanish. Guidry knows that the first rule of running is “don’t stop,” but when he sees a beautiful housewife on the side of the road with a broken-down car, two little daughters and a dog in the back seat, he sees the perfect disguise to cover his tracks from the hit men on his tail. Posing as an insurance man, Guidry offers to help Charlotte reach her destination, California. If she accompanies him to Vegas, he can help her get a new car. For her, it’s more than a car— it’s an escape. She’s on the run too, from a stifling existence in small-town Oklahoma and a kindly husband who’s a hopeless drunk. This historical fiction novel will appeal to every type of reader as it’s intelligently written with an excellent plot and fantastic characters. Set in 1963, within the backdrop of the JFK assassination, Frank Guidry is a lieutenant for mob boss Carlos Marcello, who is clearly instructing Frank to tie up loose ends regarding the assassination. Frank is invaluable or so he thinks but what if he too becomes a loose end? He goes on the run and inadvertently meets up with Charlotte Roy and her two daughters. Charlotte just escaped a life with her alcoholic husband but her car has stalled on the side of the road. Just when she thinks her plan to escape will fail, along comes Frank, bringing mystery and adventure into her life. 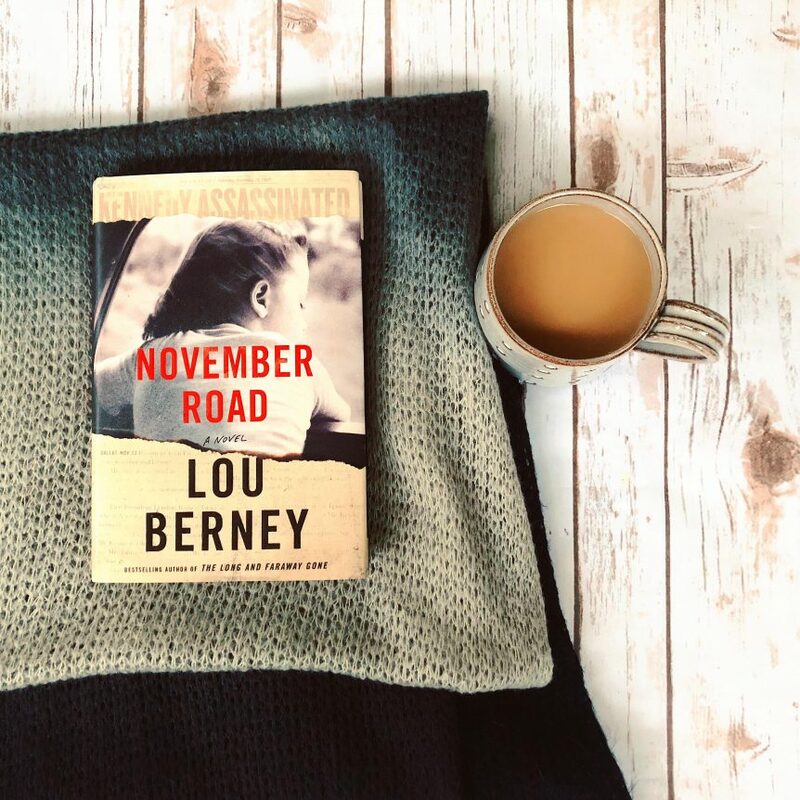 NOVEMBER ROAD is addicting as the chapters alternate between the perspectives of Frank and Charlotte. I am very impressed and it is quite refreshing that the characters’ dialogue is incredibly realistic. Frank and Charlotte are flawed but likable characters which are my favorite kinds. And even if you don’t agree with their actions, you find yourself rooting for them throughout the entire story. Also, there is a bit of cat-and-mouse in this story as Frank is being chased by a notorious mob. I absolutely loved the Route 66 setting with the true events of the JFK assassination and the subsequent conspiracy theories looming large in the background. The theme of redemption, reinvention, and the thrill of starting over, makes for a compelling and exciting read. There is something for everyone here and if you like historical fiction with a little kick, you’ll love this one! I got this last month from BOTM! I need to read it soon. I’m a sucker for anything Kennedy related. I’m so happy to hear you liked it! It’s in my TBR list, and I’ve heard differing opinions. I love historical fiction though, and even characters who make decisions I don’t always agree with – like you mentioned. It brings an element of realness to those characters. Kind of like these differing reviews, we don’t all see everything through the same lens. Love your IG & just started following your blog. I’m excited to read my copy of this one. Glad you liked it. My IG handle is @bibliokyra. Thanks for the chance! Following the blog now 😀. Love your reviews! I’ve been curious about this one.